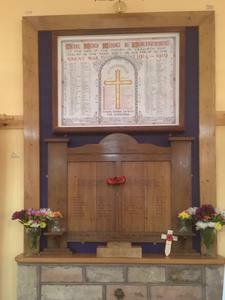 Nowy headed wooden Board and frame with two panels bearing painted inscriptions, with the left hand side listing WW1 dead and the right listing WW2 dead. Mounted in an oak surround with plain capitals, pedestal feet and small shelves at the base of the right and left hand verticals. CATBROOK/ AND/ DISTRICT/ MEMORIAL HALL/ ROLL OF HONOUR/ Left Panel: ERECTED TO THE MEMORY OF / THE FALLEN OF THIS PARISH / AND DISTRICT DURING FIRST / WORLD WAR 1914-1918 / (Names) Right panel: ALSO TO THE MEMORY OF THE / FALLEN OF THIS PARISH AND / DISTRICT DURING SECOND / WORLD WAR 1939-1945/ (Names)/ AT THE GOING DOWN OF THE SUN AND IN THE MORNING/ WE WILL REMEMBER THEM. Comments: Donated by Works Carpenter at RMPF Ordnance Factory/Base, Caerwent, Monmouthshire.